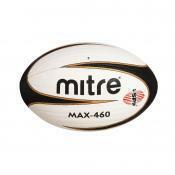 The 460 (RRP £39.99) is a pioneering professional rugby ball from Mitre. Available in sizes four and five, this ball has a special ‘high tac’ formula rubber compound to enhance hand-to-ball grip in all weather conditions. The ball boasts patented G-Spin groove technology and, along with its aerodynamic emboss and shape, provides unrivalled kicking and handling performance. The patented technology provides unmatched accuracy and promotes greater kicking distances. Trueness of flight is also enhanced thanks to the balanced in-seam valve.